An indispensable atlas of the best cocktail recipes—each fully photographed—for classic and modern drinks, whether shaken, stirred, up, or on the rocks. How do you create the perfect daiquiri? In what type of glass should you serve a whiskey sour? What exactly is an aperitif cocktail? 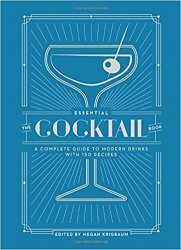 A compendium for both home and professional bartenders, The Essential Cocktail Book answers all of these questions and more—through recipes, lore and techniques for 150 drinks, both modern and classic.